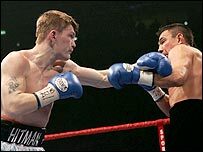 Like all sports, boxing has a number of words and phrases which describe its various rules and techniques. The referee counts from one to 10 seconds when a boxer is knocked down. If the boxer is still down at the end of the count then a loss by knockout is declared. A boxer is considered knocked down if any part of his body, aside from his feet, hits the canvas. This position occurs when one or both boxers hold the other in a way that hinders the other's punches and their arms become entwined. The referee separates them by shouting 'break'. The junction of the ropes where a contestant rests between rounds. 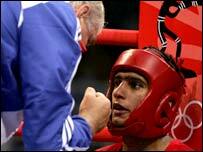 The boxer's second advises him tactically, gives him a pep talk and tends to any wounds or injuries. A boxing contest, also called a 'match.' A bout consists of four two-minute rounds, with a one-minute break between rounds. You've heard the saying 'below the belt', well the belt is an imaginary line from the navel to the top of the hips below which an opposing boxer is not allowed to hit. This is a short sideways power punch delivered by either hand with the elbow bent. It's often used to knockout effect. This a quick punch thrown with the lead hand that does not have the boxer's full weight behind it. It can be used as a set-up for power punches, as a way to gauge distance or as a defensive move to slow an advancing opponent. This is when you deflect an opponent's punch using either your glove or arm. You'll have to disguise punches to avoid this. This is the name of the fighting period. A round usually lasts two or three minutes. A bout is divided into a number of rounds with a one-minute rest interval in-between them. This a series of punches thrown in sequence. For example a left jab, followed by a straight right, followed by a left hook. This is the traditional declaration of defeat in boxing. If the boxer's assistant, known as his 'second', feels his boxer is taking a bit of a beating and doesn't think he can continue the bout he literally throws a towel into the ring to end it. This is the parts of the bout where the boxers fight at close quarters to each other so that blows using the full reach of the arm cannot be used. No, not the cheesy sitcom set in an American high school! This is when a boxer is being counted out and he is quite literally saved by the ringing of the bell that marks the end of a round. This is the pre-bout ceremony where the contestants are weighed to make sure they are within the limits for their division.